In the fall of 1870 two men, Hiram C. Bull and Lyman T. Earl, set out from Cawker City Kansas to establish a new town in the South Fork Solomon River valley. They were drawn to this location by the 200-foot high bluffs rising above a wide bend in the river and proceeded to lay the first town site in Osborne County. A nickel was tossed and the new town was named Bull City after Bull instead of Earlsville after Earl. 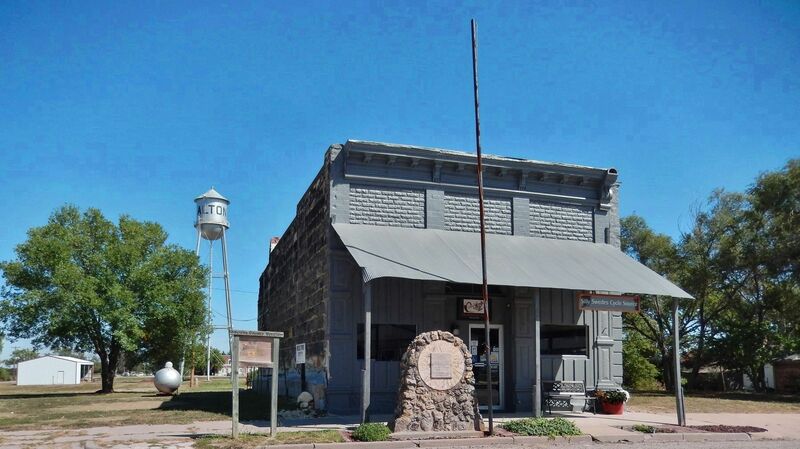 In May 1871 the Bull City Post Office opened in Bull's general store with Hiram Bull as its first postmaster. Bull was commercially and socially the key to the early development of both the town and the entire region. He and two other men were tragically killed by Bull's pet elk in October 1879. This event made national headlines and forever altered the course of the town's future. Bull had been a beloved civic leader, county probate judge, and at the time of his untimely death was in his second term as a Kansas State Representative. Bull's funeral drew nearly 2,000 mourners from across the region - the largest funeral held to date in north-central and northwest Kansas. The store occupied the front room while the back room served as living quarters. initiated by a handful of supporters to change the town's name, for the word bull was an offensive word in polite company and some felt it was detrimental to the town's growth. So after a legal petition to change the name failed, a fraudulent petition was sent to Washington. D.C., with the signatures cut from a popular road petition and pasted to the name change petition. In February 1885 the U.S. Postal Department changed the name to Alton (after Alton, Illinois, the name-change leader’s hometown). 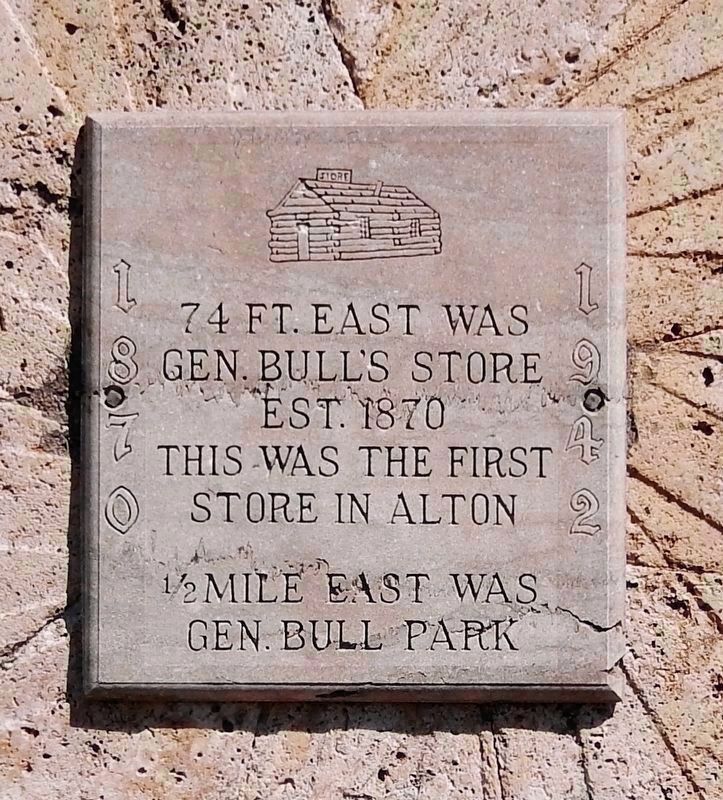 On October 1, 1885, Alton was incorporated as a third-class city. 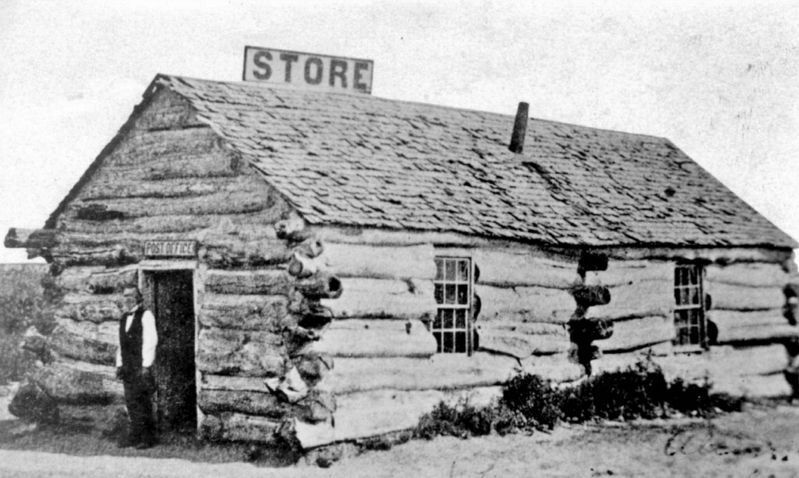 • Hiram C. Bull’s two-room log general store. The store occupied the front room while the back room served as living quarters. • Sketch of the death of Hiram Bull by his pet elk as depicted in the National Police Gazette magazine of November 1, 1879. • Sketch of Bull City as it looked in 1884. View is to the south with the railroad tracks in the foreground. Nicholas Avenue runs through the town from left to right at center background. 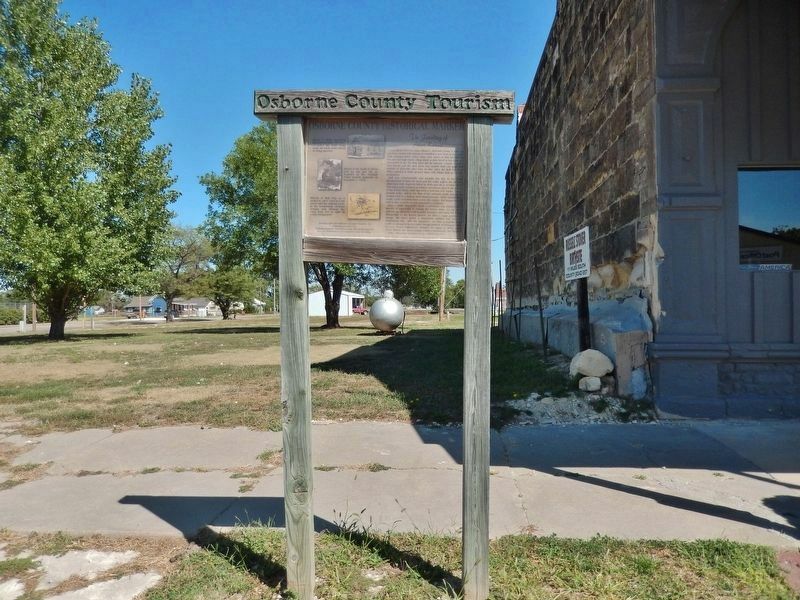 Erected 2001 by Osborne County Tourism, Inc.
Kansas Department of Commerce and Housing. 39° 27.94′ N, 98° 56.863′ W. Marker is in Alton, Kansas, in Osborne County. Marker is on Mill Street south of Nicholas Avenue, on the left when traveling south. Touch for map. Marker is mounted in a heavy-timber wooden frame near the northwest corner of the building at this address, facing Mill Street. Marker is at or near this postal address: 702 Mill Street, Alton KS 67623, United States of America. Touch for directions. Other nearby markers. At least 3 other markers are within 11 miles of this marker, measured as the crow flies. The Historic Bohemian Hall & Cultural Center (about 500 feet away, measured in a direct line); Alton (approx. half a mile away); Last Indian Fight in Osborne County (approx. 10.3 miles away). 3. Hiram C. Bull – 1996 Inductee, The Osborne County Hall of Fame. More. 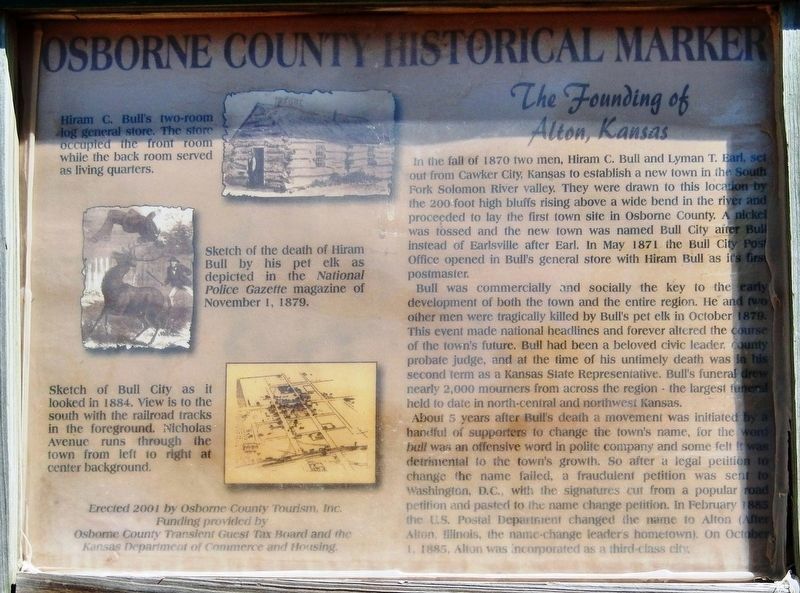 Search the internet for The Founding of Alton, Kansas. Credits. This page was last revised on March 28, 2019. This page originally submitted on March 27, 2019, by Cosmos Mariner of Cape Canaveral, Florida. This page has been viewed 39 times since then. Photos: 1, 2, 3, 4, 5. submitted on March 28, 2019, by Cosmos Mariner of Cape Canaveral, Florida.